Unlike many other drain unblocking companies there is no call out fee and we do not charge an hourly rate. All drain clearance jobs are completed for a fixed fee. 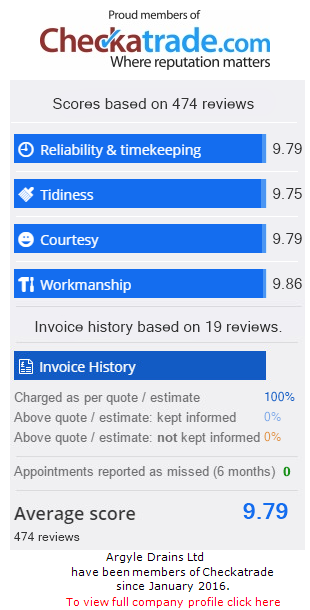 Argyle Drains is a genuine family run business that enjoys top ratings on checkatrade, politeness, promptness and value are important parts of our drain unblocking service. Blocked drains in Kent are cleared in a fast efficient manner using the latest equipment and techniques. Argyle Drains clear domestic and commercial drains. If you have a blocked drain in Kent look no further, we will have your drain unblocked in no time. Fast Response and Fixed Prices. Why Do Kent Drains Get Blocked? There are many reasons for blocked drains in Kent some typical reasons include a build-up of fat and grease or the roots of a tree affecting the drain. Other problems can include cracked and damaged drains or a build up of dirt or silt this can be due to building works in the drains immediate area. Drain joins can also become displaced. Blocked drains can also be caused by the flushing of the wrong type of materials. These include baby wipes or paper towels, such objects become snagged in the bends of the drain. Over time they attract grease and other materials which slowly causes a build-up of foreign objects in the drain resulting in a blockage. It is important to act at the first sign of a blocked drain in Kent as when left too long the drain blockages can become a severe problem. Acting fast can help you to save money in the long run as drains can often be unblocked quickly and with minimum hassle. How Do We Unblock Kent Drains? Most blocked drains can be cleared fairly easily, firstly we will assess the blockage and will normally be able to unblock the drain with specialist drain rods. At Argyle Drains we posses a 4000 PSI water jetting system which unblocks the most stubborn of blocked drains. Please Note: our drain jetting system is very powerful, Argyle Drains cannot accept liability for any damage or the Jetting Hose becoming stuck in defective drainage. These techniques include drain relining this system allows us to reline the drain with a layer of pliable uPVC which is then inflated and ultimately relines the drain. Once the blockage has been cleared we can use our CCTV equipment to fully assess the health of your drainage system. CCTV Helps us to uncover any cracks or breaks in your drain. Domestic or commercial properties, major or minor problems Argyle Drains have the equipment and know how to unblock your drains in a fast efficient and cost effective manner. Blocked drains in Kent are a thing of the past with Argyle Drains. Feel free to get in touch we will be happy to help. We Operate an Emergency Unblock Service. Areas of coverage: include: Canterbury, Whitstable, Herne Bay, Ramsgate, Broadstairs, Margate, Sandwich, Dover, Folkestone & Ashford.